"But now our sport is more of a marketing strategy. You have a bunch of athletes wearing Nike or adidas or Reebok and that is how the athletes are identified. There tension between the athletes is missing. And I suppose that is what sport is all about. Perhaps, one of the main reasons due to the lack of appeal for track and field sport today is the missing rivalry between modern-day athletes." - Hurdling legend Edwin Moses talking about the decline in popularity of track and field in the World. Thankfully, the short hurdlers of the world will race each other nearly every weekend and that's why we like them. Any other walk-ons here struggling to stay on the team? More Positive Distance News: Track & Field News Profile On Andy Bayer The 2011 breakout star will redshirt outdoors. Cathy Freeman Pregnant With Her First Child This news of course has made tabloid headlines in Australia where Freeman is an icon. The pregnancy has triggered Freeman's Type 2 diabetes but she appears to be doing well overall. Post-Race: LRC Alan Webb Throws A Tantrum After Disappointing Opener Alan Webb's competitive fire is legendary and the dark side of that competitive fire was on full display after Webb's disappointing performance. We've seen many athletes get upset, but none like Webb on Saturday night, especially after an earlier season opener. We've got the details and try and give some perspective to Webb's behavior. High School XC Star Arrested For Armed Robbery Of Gas Station The kid tried to use a knife and the clerk pulled out his own knife to thwart the robbery. The kid is the same kid who got attention earlier this year on LRC in this thread: "HS football player runs 15:11." 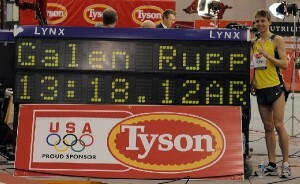 Mo Farah Targeting British Indoor Record Of 13:21.27 In 2 Weeks In Birmingham Vs. Galen Rupp? Rupp is still entered in the 5k in Germany this weekend and entered in a 10k in New Zealand in 3 weeks. No way he runs all 3 races. 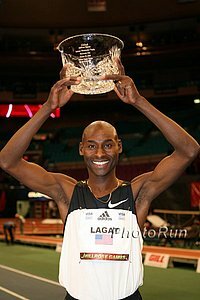 The 5k in Birmingham seems like a better place for an opener since he dropped out of a mile race with an asthma attack, but that would put into doubt his American record attempts at 10k. Discuss Rupp's plans here. World 800m Champion And Olympic Silver Medalist Mbulaeni Mulaudzi Seeks Help From Old Rival To Try To Break South African Record Of 1:42.69 Mulaudzi is being coached by his old rival Hezekiel Sepeng with two goals in mind: an Olympic gold and breaking Sepeng's SA 800m record. Sepeng said: "[Mulaudzi] approached me and said: 'Look, you have the experience so come and coach me.' I froze at first because I thought: 'this guy's won the World Championships, what am I going to do, make him win again?' If I don't I would have failed." 250,000 Apply To Volunteer For London 2012, But Only 70,000 Will Be Chosen *Coe Warns Olympic Volunteers That Their Jobs Won't Necessarily Be Easy 8-hour shifts and they most likely will be forced to work the Paralympics as well. Heineken Will Be Official Beer Of 2012 Olympic Games Sad that the Brits couldn't get a company with local ties. More British-Related News: Olympic Marathon Champ Constantina Dita Hoping For 2:28 In London Remember, she's now 41 years old.